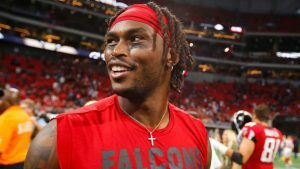 Julio Jones laughed as he glanced at the video of himself running cones barefoot in the sand while simultaneously catching tennis balls. So Jones and Owens worked, and worked and worked. Their workout sessions started around 8 a.m. and typically consumed most of the day. They connected everywhere from the University of Alabama, where Jones starred in college, to Georgia’s Johns Creek High School, where Jones’ good friend and former Falcons teammate, Roddy White, is an assistant coach.